Zinner uses his vast array of effects to achieve the band’s recorded sounds through samples and looping, as well as compensate for the lack of a full-time bass player with a broader tonal spectrum. His main board (far right) is home to a DigiTech JamMan, Line 6 MM4, ProCo DeuceTone RAT (his primary fuzz tones), Boss DD-7, HBE Power Screamer, and Electro-Harmonix Graphic Fuzz. To the left of that, his second board has a DigiTech Whammy, another DigiTech Jam Man, a Line 6 DL4, Electro-Harmonix POG, and TC Electronic Flashback Delay. His third board contains a second Line 6 DL4, and three Eventide pedals: TimeFactor, PitchFactor, and Space. Finally, by his amps, is a fourth board with two more sample-loaded DigiTech JamMan pedals. Before his signal goes into his amps, it hits a TC Electronic Classic Booster + Distortion. You can see the Homebrew Electronics Power Screamer in the picture which I included on the left. 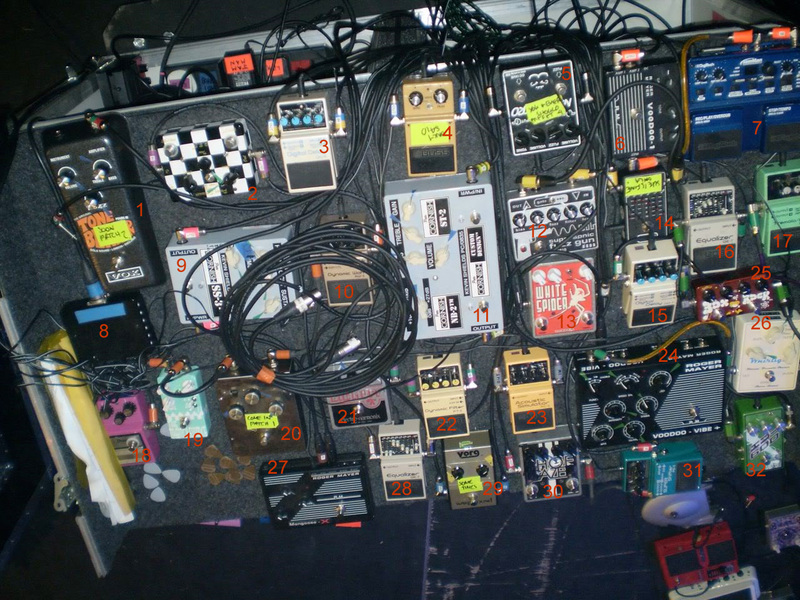 This is a photo of one of Brad's pedalboards when he was still with Third Day. You can have a better look at this pedalboard here. The Homebrew Electronics Power Screamer is a gain, overdrive and distortion pedal. It is the second pedal from the left in the middle row (beneath the dark blue Chorus-Vib). You can have a closer look at this pedal here. On this image you can clearly see all of the pedal's knobs and controls. This pedal is exactly the same as Brad's pedal, except for the color. No reviews or videos yet for Homebrew Electronics HBE Power Screamer Overdrive Pedal. With an Equipboard account you can rate this item, add it to your collection, submit a review to discuss what you like and dislike about it, and associate Homebrew Electronics HBE Power Screamer Overdrive Pedal to artists that use it. Create an account!